How often do you read a newspaper nowadays? What do you think of it when it comes to seeking information? The answer to these questions may seem quite easy and obvious but the long history of traditional press goes back many centuries ago and this is why it is worth comprehending its operation model. 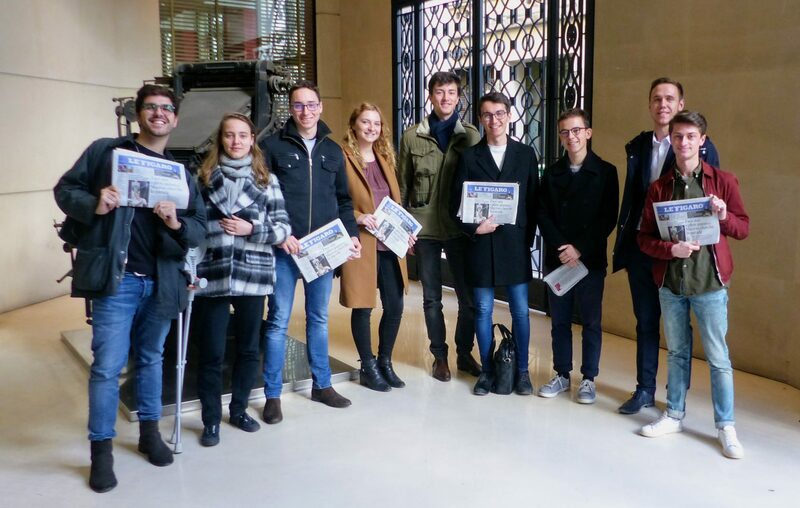 This was the mindset behind the visit to the offices of Le Figaro, the oldest national daily French newspaper founded in 1826, which still exists today and historically has been the standard-bearer of France’s center-right. On November 13th, we were standing in front of the majestic building in Boulevard Haussman, utterly in awe of what was lying behind these doors. It only took us 10 minutes to be part of the work routine in a daily newspaper: the intense scent of fresh printed newspaper on the ground floor, reporters walking fast under the enlightening glass-ceiling in order to keep pace with the news that need to be covered and reported. While waiting at the cafeteria, the KIP team was surrounded by journalists being seated next to them along with their notebooks or laptops while writing down the news agenda of the day. 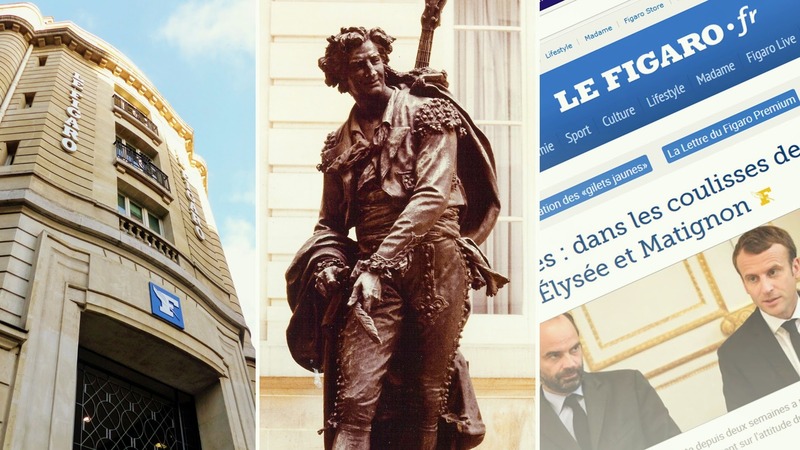 The 3-meter statue of Figaro is showcased next to the cafeteria and at the same time in the center of the whole building, symbolizing the heart of the newspaper’s operation that is concisely expressed by its slogan “If there is no freedom to criticize, no praise can be taken seriously”, originally appeared in Beaumarchais’ comedy play Le Mariage de Figaro . What followed was undoubtedly the most interesting part of the visit. Fabrice Nodé-Langlois, Head of International Economy at Le Figaro, arrived to lead us to the meeting room where the editorial board would gather together to discuss about the news agenda and prepare for the edition of the next day. The rising absenteeism rate of public servants or the transfer of the French Central Bank’s money to a new vault were some of the various topics around economy, business, technology and media that were presented among the board members. 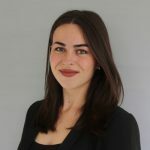 Each topic was then followed by a bold argumentation from the editor’s side in regards to its progress and significance in order to get the green light, or not, by the editor-in-chief, and result in being placed on a page within the economic section. Upon completion of the meeting, a constructive conversation occurred between Fabrice Nodé-Langlois and Marc Landré, editor-in-chief of French Economy at Le Figaro, and our team regarding the challenges of a newspaper nowadays and more specifically the future of Le Figaro. In the age of political correctness, the rising threat posed by fake news  and filter bubbles  and the free access to information on the Internet, how can a newspaper still have a great leverage? The answer lies in diversification. In France, the printed newspaper and news magazine sector remains in crisis with readership halving in the last six years from 46% to 20% . 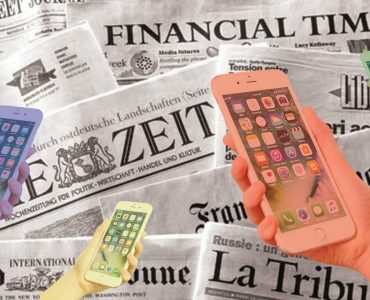 As a result, many former newspapers like Le Monde and Le Figaro are leading the charge online and incorporate new activities within their value chain. Every user has a unique Facebook’s personalized news-stream and from now on, the Figaro Live service will be part of it as the newspaper has integrated a studio TV, in other words an interview room with all the necessary equipment (microphone, prompter, green background) but also the control room where all the technicians record, change the lights or the cameras. The aforementioned diversification leads to the newspaper’s redefinition and recreation as a multimedia source of information shaping a whole new experience for the audience. 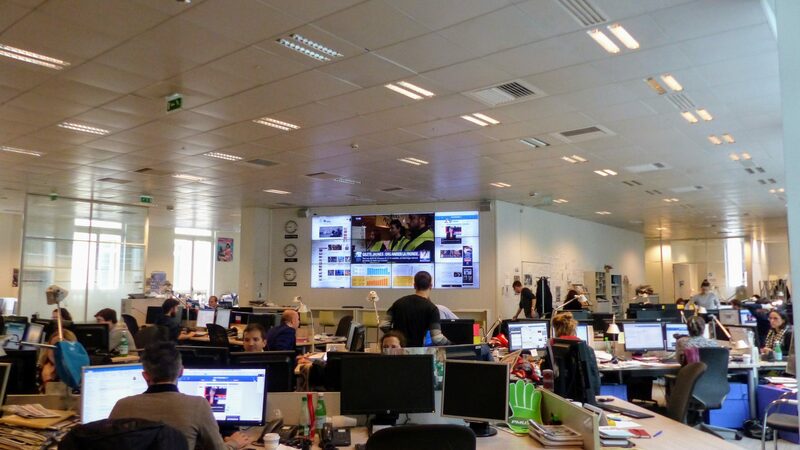 As stated on the newspaper’s walls everything changes in Figaro: the newspaper, the website, the social media and now Le Figaro TV. The future lies ahead with a bold vision: “as soon as you’ve finished reading Le Figaro, it’s the moment to start watching it”. 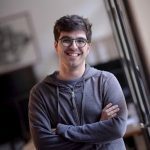 Filter bubble: phenomenon introduced by Eli Pariser, internet activist, and occurs when a website algorithm selectively guesses what information a user would like to see based on information about the user, such as location, past click-behavior and search history. Étudiant grec en MSc Media Art and Creation à HEC Paris (Promotion 2019). Membre de KIP et contributeur. Greek student in MSc Media Art and Creation at HEC Paris (Class of 2019). Member of KIP and contributor.